Posted by Khoi Doan on December 29th, 2016. The Hack@WPI Hackathon is open for registration. Check out the main website for more details. Posted by Khoi Doan on October 27, 2016. ACM is hosting the BBQ next Wednesday, November 2nd from 11am - 1pm. Free food will be provided, so stop by for some burgers! Posted by Khoi Doan on March 27, 2016. ACM will be hosting the annual CS coffee house on Thursday, March 31st from 6pm - 8pm. There will be free coffee, hot chocolate and more! If you are interested in performing, please complete the form here. Posted by Ian Naval on December 11, 2013. 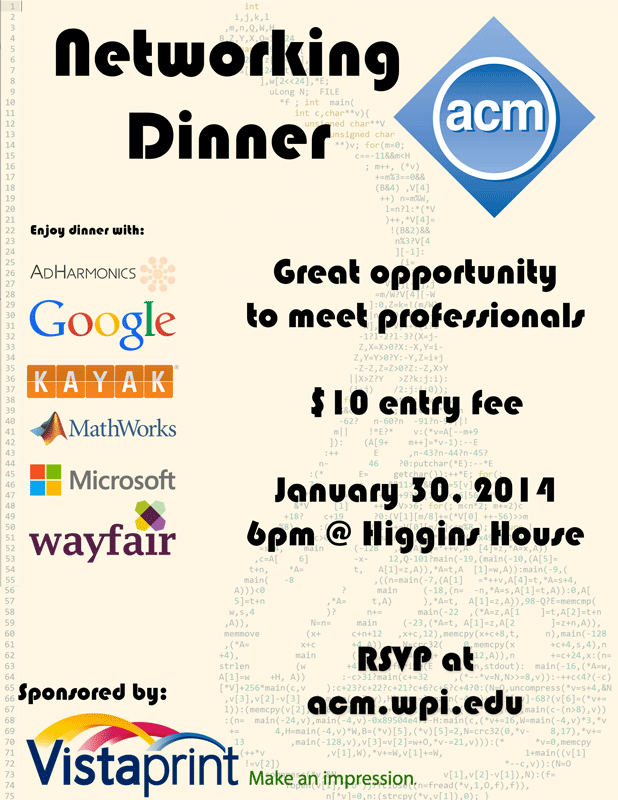 Come enjoy dinner with representatives from AdHarmonics, Google, KAYAK, MathWorks, Microsoft, VistaPrint and Wayfair! The dinner is Thursday, January 30th, 2014 at 6pm in the Higgins House. There is a $10 entry fee for students. The networking dinner is a great opportunity to meet professionals in the CS industry. This year's networking dinner is sponsored by VistaPrint. Posted by Ian Naval on November 22, 2013. Posted by Ian Naval on October 30, 2013. The ACM is hosting a Linux Installfest on November 12, 2013 in HL 213. Pizza and drinks are provided. Come check out a few users use linux, and try out linux for yourself.